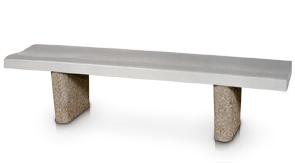 This simply styled commercial grade concrete bench is perfect for municipalities, gardens or parks. Concrete is a great material for site amenities because it requires very little maintenance, is extremely durable, and the heavy weight is a natural theft deterrent. Backless design allows users to enjoy the scenery from both sides of the bench. Bench seat is also contoured for extra comfort. 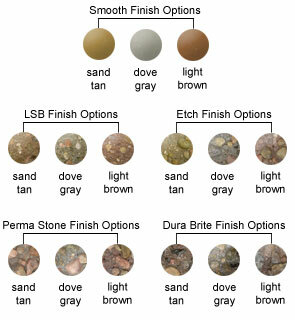 Choose from the variety of colors and finish options shown below. Bench seat has a smooth finish while the bench frame can be finished in the aggregate finish of your choice. Seat - Smooth Finish Only. Frame - Smooth, LSB, Etch, Perma Stone &	Dura Brite Finish Options.